In the never-ending landscaping saga, we had yet another item on our to-do list. And that item was way bigger than we could do ourselves, so we hired out. And that item?? 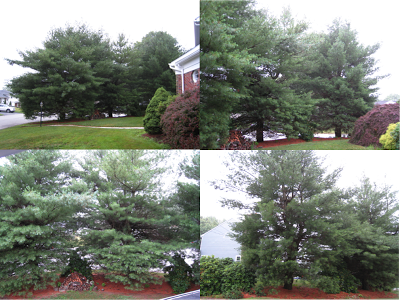 Our front yard was mainly taken over by three absolutely gigantic Scotch Pine trees. Don't get me wrong, they are beautiful in the snow, and they gave us a lot of privacy, but they were taking over our yard, and not in a good way - I mean, it's not like they can weed all my garden beds, right? :) The other downside to the trees was that they were hiding the house, and making it difficult for anyone to find our house, including the fire department! I know, it sounds impossible, but when your address is on street A and your driveway and front door are on street B with three 60-ft trees hiding it, it is kind of difficult to find. Yep, there's actually a house back there! Now you know why it's so difficult to find! We called up our tree guy, David from Schwartz Tree & Landscape, and after evaluating whether or not we could just trim back the trees, or remove one or two of them, he said that it would be best to just remove all three of them. Before shots of the trees. Clockwise: 1 - From the driveway; 2 - From the front door; 3 - From the Master Bedroom; 4 - From the street, on the left. 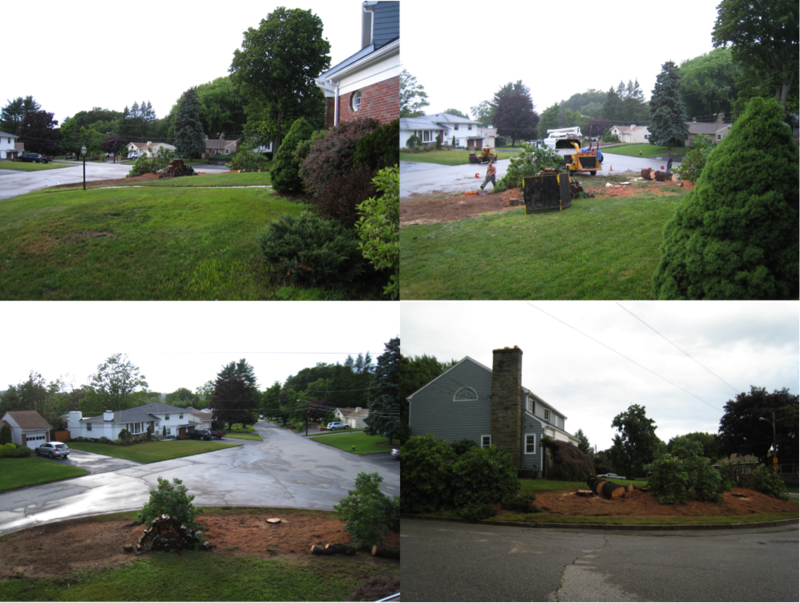 Three weeks later, the crew arrived at the house, and spent nine hours taking down the trees, and they still have a little more to go. But the change is dramatic! While you would expect them to start at either the top or the bottom of the trees, they did neither. The guy in the cherry-picker literally drove himself into the middle of the tree and started working out from there, making himself a huge hole, and doing some interesting balancing acts in the cherry-picker to cut off some hard-to-reach branches. 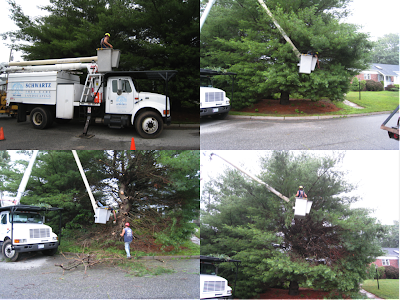 It took about two hours to get all of the branches cut off of the first tree, and another hour to get all of the branches through the chipper. Once all of the branches were off, it was time to take the trunk down. First step was to make a notch at the base of the trunk to control the direction that it will fall. In the video below, you will see the guy cut the rest of the trunk and see it fall. And pay attention to the size of the guy in comparison to the trunk. I'm not kidding when I say that these trees are massive. Once the trunk was down and all of the large logs removed, it was time for the stump grinder to be used. Since the grinder shoots the wood chips everywhere, the guys put up a netting around the workspace to shield the grass from the chippings. The stump grinder was a rotating blade that went back and forth along the stump, literally grinding it to pieces. The guys went about 18" into the ground with the grinder too, just to make sure that we have plenty of space for planting, and that we won't run into any major root systems in the area. And in less than five minutes, the stump was completely gone, and all that was left was wood chips and dirt. The other two trees came down in about the same time, a few hours each. The rains came in the late afternoon though, and that halted work on the rest of the tree stumps and grinder, because everything was so wet that it was sticking to the machine blades and getting stuck. So, on Saturday, the rest of the logs that you see in the picture will be taken away, and the two stumps will be ground out. Perspective on the size of the stumps - and yes, we counted the rings to figure out the age, and we got to 70! Some of you may be thinking that with all of those trees being gone, we would have a great stock of firewood on our hands, but unfortunately, all of the wood had to be taken away and none of it could be used for firewood, because of the amount of sap that was coming out of the branches. The picture below was taken about five minutes after the branch was sawed off, and yes, that is sap, not rain. And finally, now for the final reveal! I've made a collage like above that corresponds as closely as I can get to the before pictures. Ready? And then there were none. Amazing difference, right? I can't believe how big the yard looks, and how good it makes the house look. Plus, people can find our house now, and we will get a beautiful and unobstructed view of all the sunsets now since we're facing West. We've met at least six new neighbors since the trees came down, mainly because everyone in the neighborhood is shocked that we took them down, but all of them seem really happy about the difference that it makes. We are now so excited to do some additional planting, and already have some things in mind to add to the landscaping. 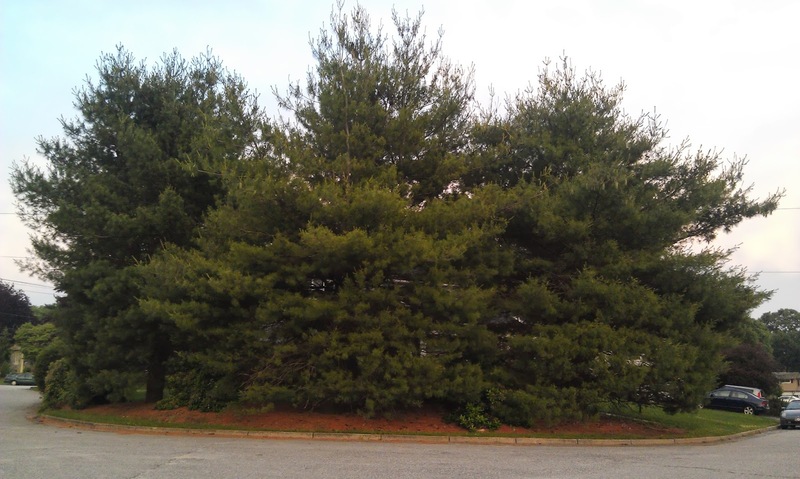 Have you removed any trees lately? How much did it impact your property?